A bit of a change for me, instead of leaving late Friday and camping close to trailhead we left early Saturday morning (4am) to get up there by morning (9am) and hike up to our high camp. 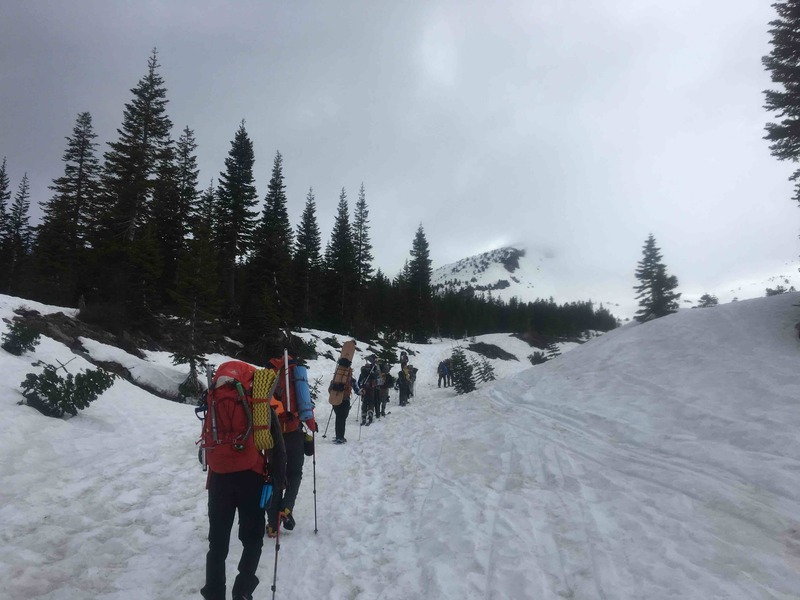 Being mid-May (guiding season) there was a steady stream of Avalanche Gultch hopefuls with us on the way up towards Horse Camp. 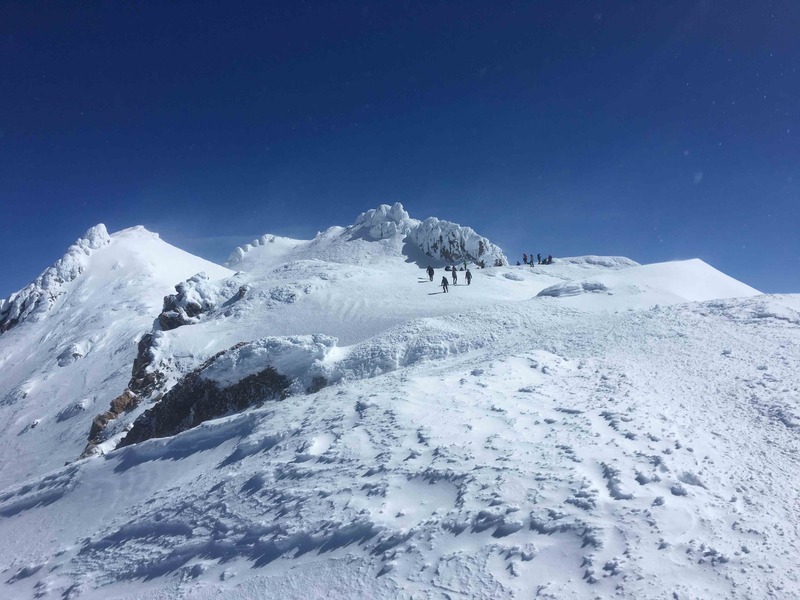 There were 3-4 dozen people on the Avalanche Gulch, but only eight on the West Face or Casaval combined. Highly recommend West Face or Clear Creek as an intro route. When we came upon Horse Camp it felt like a tent city with over a dozen tents sprawled all over the place. We were happy to be on our own heading towards West Face and up Casaval Ridge. We only had the opportunity to climb up the ridge for a short while before we started hearing a lightning storm head our way. Fearing the rain we saw at lower elevations would still be rain at our elevation and not snow we stopped at 1:30pm (9200 ft) and started digging our snow walls high (Casaval is known for wind). Luckily the lightning storm passed over within a half hour and it only took us a half hour more to clear the remaining snow and get our tents erected. The storm didn’t bring rain but these ice pellets (not quite snow) which continued for most of the day. Keeping us inside our tents and the views clouded. Wind was surprisingly light when we woke at 1:30am to get ourselves in order and were off at 2am. From the snow the night before there would be a 1-2 ft layer of ‘powder’ (ice pellets) in the gullies we crossed on top of firm snow. We made short order to the top of Casaval proper (north of 50-50) which is where things started becoming interesting. This first section forced us to traverse some rather steep (45+ degree) stuff alongside the first stone spine of Casaval. I had to revert to my technique of using the axe in self arrest position and side stepping for the traverse like at Lassen. I favor this technique which puts me on my knees instead of standing because I didn’t feel balanced walking upright at that angle. Not everyone felt comfortable during this section so this first traverse took a bit of time. 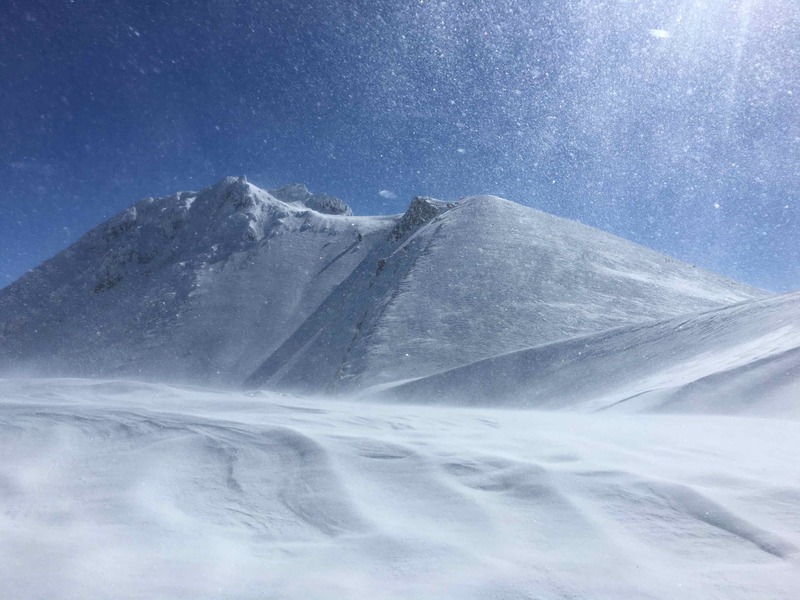 During that traverse the wind picked up to 20mph and would stay at least that constant for the rest of the day. In the next sections we would head up towards ridgeline whenever possible to do some mixed climbing stuff and catch views of Avalanche Gulch. However, we typically kept the left of the ridge. 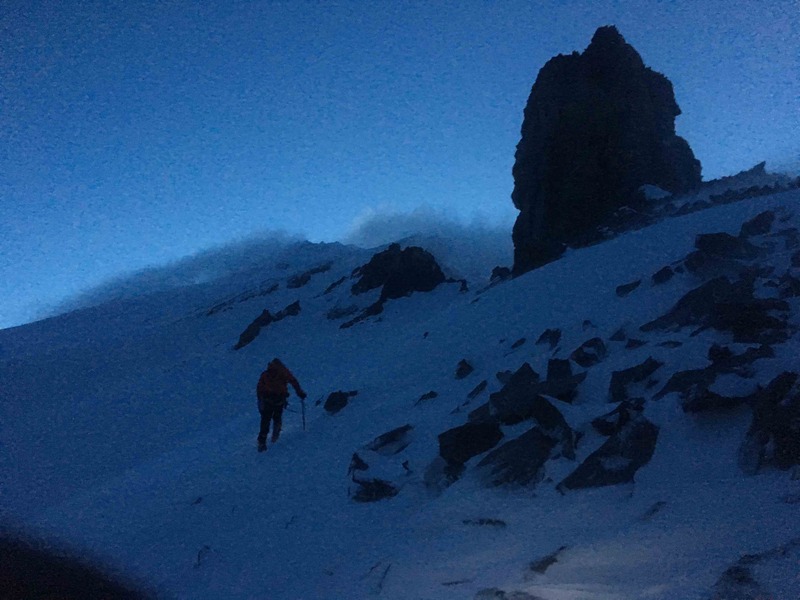 There was a bit of a pace mismatch with the group and at 7am (5 hours into our climb) we were only at 11,700 ft. One person said he wasn’t feeling it, the wind was getting to him, and decided he wanted to go down. His buddy would join him. 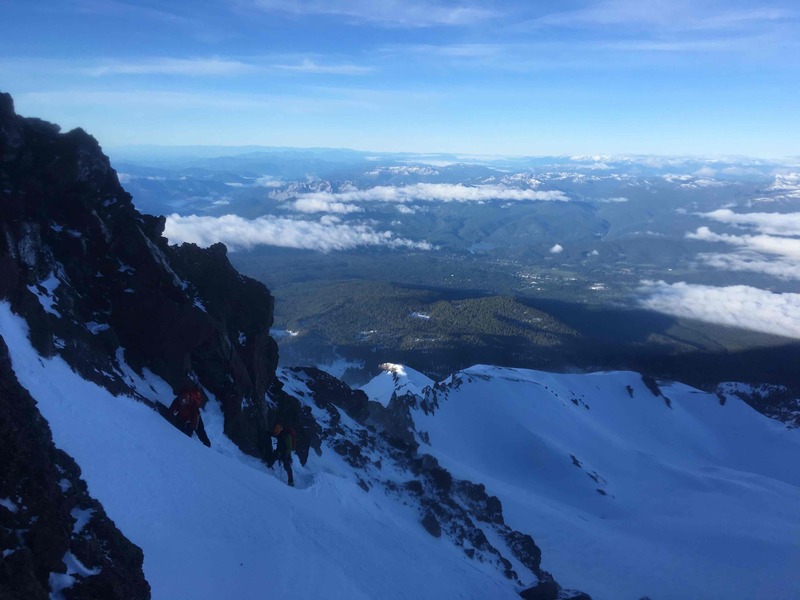 Meanwhile I felt really strong and geared up for a summit after three foiled summit attempts (Green Butte, Round Top and Lassen) this season so I asked if they would be comfortable waiting while I finished the climb on my own. 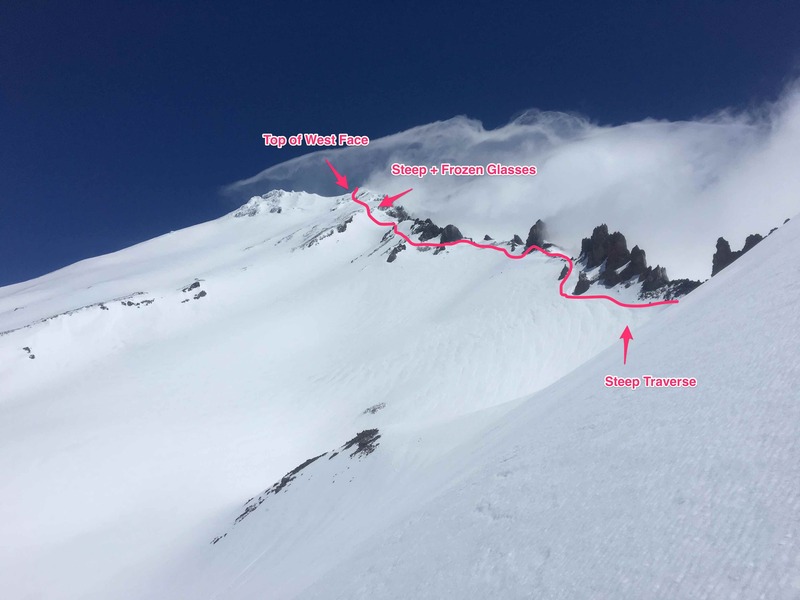 This next section I would do was referred to as looking like a wall of snow by one trip report. Better yet there was a nasty swirling of snow at the top of its crest. Amped up and on my own I headed towards the base and began climbing. At 3/4 of the way up the wind had picked up to at least a constant 30 mph picking up snow from the crest to create a river of ice pellets flowing down the center. If I stuck my hand against the slope snow would cover 1-2 inches of it in a second. Condensation was fogging up my sunglasses and the wind froze them over with a layer of ice blurring my sight so I couldn’t make out any details. Taking them off meant stinging ice in my eyes when looking upwards at all for navigation. My breath on the buff over my face also caused it to start freezing and caking with snow particles making it difficult to breath. Feeling part suffocated and part blind I started to reconsider this going solo choice a little. Meanwhile, moving around was risky because I was on a 45+ degree slope with deep snow that didn’t provide as much friction for my axe. As a result, finding some way to get visibility and maneuver to a place I could reconfigure myself took about 20 minutes, but felt like forever. Close against a rock down from the crest I was able to rub the ice free, reconfigure my buff so a new section was over my mouth and get things situated so my glasses didn’t fog up. (I’m definitely bringing ski goggles next time.) I pushed for the crest, got over it to less steep terrain and was free of the tiresome fight. I didn’t want to push my luck after this since I was solo and abandoned Casaval Ridge in favor of a traverse left up the West Face closest to Casaval Ridge. At 9:15am I made it on the ridge at 13,210 ft.
Top of West Face looking at the Summit and Misery Hill. You can see it was still quite windy. After passing the crest the wind was a constant 20 mph for the rest of the climb. Picking up to 35 mph on the West Face rim traverse to Misery Hill. After a windy traverse over to Misery Hill it again lived up to its name and I started feeling nauseous. I was moving slowly and got to the top (13,780 ft) at 10am. A slight headache started here, but it was not as intense as last year nor did I feel dizzy like last year. However, it was a painful slog to the top of the summit. Everyone walking toward it slowly like drunken cowboys or zombies craving altitude. I attribute my better handling of altitude to my aerobic training and I drank + ate a lot more than last year on the climb (2L instead of 1L). I made summit around 11am and then started down. From the top of the West Face I joyfully glissaded a whole 3500 ft in about half an hour. It took me a little bit to climb back up to Casaval Ridge and then find my camp since a cloud had fallen on this part of the ridge. However, I got back to camp quickly at 1:30pm and we were back at the trailhead by 4pm. You can see the route was in good condition with all the snow. Check out my photos on Flickr if you want to see more pictures.